On Tuesday May 12, nearly 2,000 community leaders, federal officials, and members of the public will gather in Washington, DC for the first-ever White House Summit on Asian Americans and Pacific Islanders. The Summit will be an unprecedented and historic all-day convening of senior federal officials and leaders from across the country. The day will include conversations with federal officials and AAPI leaders, artistic presentations by distinguished AAPI artists, and interactive sessions on diverse issues including economic growth, education, health care, civil rights, and immigration. If you can't make it to Washington DC, but would still like to sit in on the conversation, you can watch a livestream of the Summit here, May 12, from 9:00-11:30am and 3:00-6:00pm Eastern Standard Time. 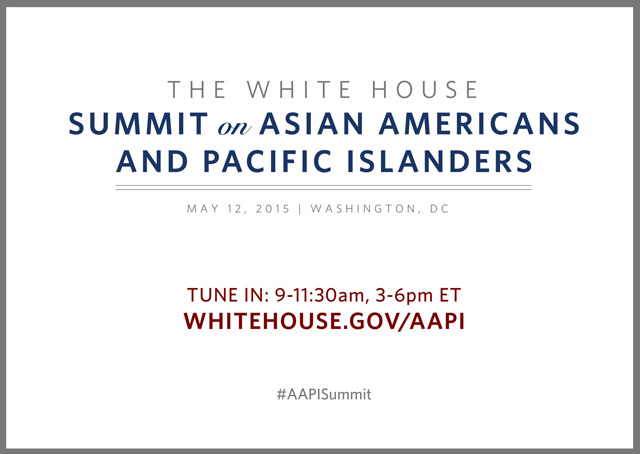 You can also join the conversation online using #AAPISummit.